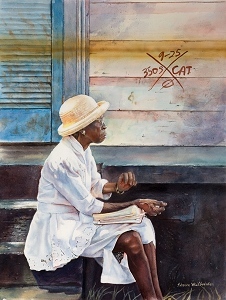 Online portfolio of artist Sharon Weilbaecher- original watercolor paintings, pencil drawings and original limited edition lithographs, by New Orleans artist. Sharon Weilbaecher’s paintings were in the Garden District Gallery’s 2015 CARNIVAL Group Exhibit. Her Painting, “Keep on Blowin” was on the cover of the Invitation. 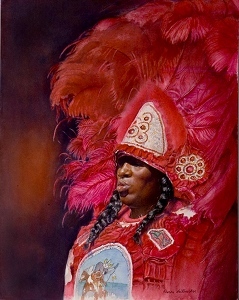 In 2012 three of Sharon Weilbaecher’s watercolors were selected for the Invitation Group Exhibition, “Aquarellistes:Louisiana’”, Paul and Lulu Hilliard University Art Museum, Lafayette, La. Sharon’s work is featured in AMERICAN ARTIST’S WATERCOLOR MAGAZINE in a special publication, The Best of Watercolor 2010, (articles on 14 artists selected From the last 6 years of publications in Watercolor Magazine). The 12 page article about Sharon’s work by M. Stephen Doherty is “Telling Personal Stories That Touch Viewers, pps 94-105. In my painting I like to portray the beauty and interest I find in everyday life and ordinary people. My earlier training and career as a Medical Illustrator involved detail, accuracy and knowledge of human anatomy. It taught me to really see, not just look. Some of my painting and drawing techniques derive from my Medical Illustration background. I notice subtleties and delight in painting them. Shadows, light, fine detail, imperfections that make up a person give that individual character. The way wrinkles lie on a dress or on a face excites me. I enjoy capturing the play of light reflected on figures or objects. To me a stray wisp of hair, a smudge on a dress, or a puddle in a road is more interesting than a look of perfection; beauty does not equate with perfection. When I travel, I look for people or scenes that interest me. I delight in capturing an instant in time and dwelling on a subject. For one moment in time a person or scene is depicted clearly.